Natasha Carr-Harris has been a passionate and devoted reader since she was little. Her reading interests encompass both classic and contemporary literature. 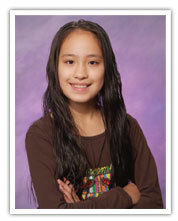 She was nine years old when her first poem was published by the Poetry Institute of Canada in 2007. Since then, six more poems and three short stories have come out. At age eleven, she was the youngest writer in a 3-Day Novel Contest held in Vancouver in 2009. The contest included participants from twenty countries. It was then she wrote “The Story of St. Patrick’s Day.” She was subsequently interviewed by the Vancouver Sun Newspaper and reported as an “excited young writer”. Natasha believes that her writing talent springs from her spare-time interests in table tennis, ballet, piano and public speaking, all of which have helped her become more creative. Since 2008, she has won five medals from the Canadian National Table Tennis Championships. She was also a delegate of the 2010 Miss Canada Teen Global pageant, where she won the award for “Top Promotions”.